I know I repeated the same words a million times describing this recipe, but to keep it as easy as possible I kind of had to. I’ll start cross referencing a thesaurus next time. lol It seems a little intimidating because of how long it is; I promise if you actually take the time out for it, it’ll be worth it. Test it out and add your own flare to it. Mix up the vegetables or even the broth of this ramen. I’m excited to see what you do with it. A vegan friendly dish that is also good for someone looking to cut back on your normal go-to ramen. 1/4 cup olive oil garlic olive oil from Trader Joe's works perfectly. 2 cups mushroom or a vegetable broth. The first thing you'll want to do it get your tofu marinated. The longer they sit in the seasonings the better the flavor. Once they brown you'll add your garlic into the pot with your ginger. Stir to make sure it does not burn. Once you start smelling the 3 ingredients combined or seeing them cooked, add your broth, water and soy sauce. Stir them together and add your seasonings. Make sure that it does not boil. Add to super low heat and cover. While your broth binds together with flavors, start spiralizing your zucchini. In order to not make your zucchini mushy, place them in a bowl that can absorb heat. Blanch them with boiling water and then rinse them with cold water to stop the cooking process. You can then put them in the fridge to stay cool. Your bok choy does not take long to cook. I charred them in the broiler after lightly coating them with the garlic olive oil. Be sure to keep your eye on these because they will burn quickly. Now it's time to get that tofu nice and crispy! You'll add it to a coated, heated pan and sear each side for 4-5 minutes or until desired color. Give your broth a stir and a taste then start the layering process. 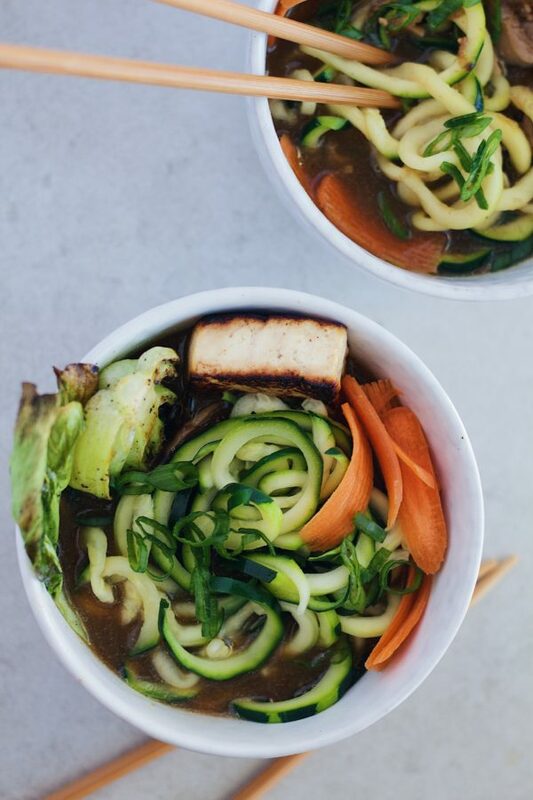 Add your pan seared tofu, the charred bok choy, the broth and leave space for the zoodles. Lastly, top with your green onions and carrots (for crunch), fresh garlic & ginger (optional) -- Don't forget to take a picture! If you want to add more hearty flavors you can go with a beef or pork broth and sear a fatty cut of beef or a pork belly. You can also go with a chicken broth and pan sear the chicken.